Employing the identical technology as fitness workout stations found in exercise centers and gyms, the Universal Access Chest Press is designed to deliver the same performance but, combined with a fresh outdoor experience. Promotes socialization by encouraging cooperative use that fosters shared inspiration and support. This double sided station reserves one side for a mobility device to take full advantage of the machine, the opposite side has weather-proof contoured ergonomic seat. The isokinetic springs activate to provide smooth resistance for an acutely targeted strength workout. 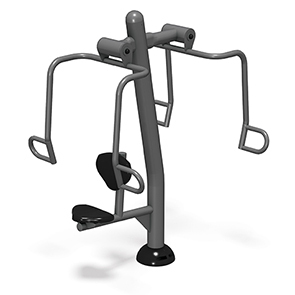 The Chest Press Station is an innovative, all-steel and powder-coated piece of outdoor fitness equipment designed for long term, community friendly use.